class="post-template-default single single-post postid-313398 single-format-standard group-blog masthead-fixed full-width singular wpb-js-composer js-comp-ver-5.7 vc_responsive"
Governor Ricketts meets with Kentaro Sonoura, Special Adviser to Japan’s Prime Minister Shinzo Abe, at the State Capitol. LINCOLN – Thursday, Governor Pete Ricketts welcomed Kentaro Sonoura, Special Adviser to Japanese Prime Minister Shinzo Abe, to the State Capitol. The meeting comes in advance of the 50th Annual Midwest U.S.–Japan Association Conference, which will be held in Omaha in September. Mr. Sonoura is a member of the Japanese House of Representatives and a former State Minister for Foreign Affairs. 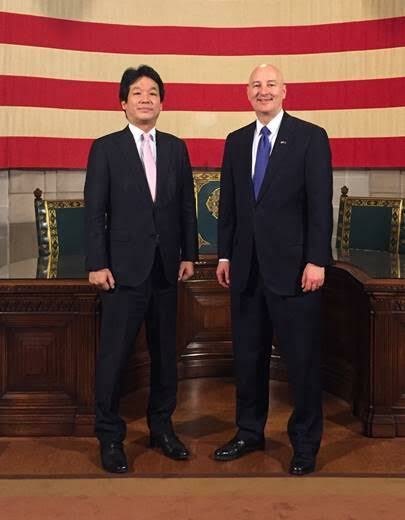 At their meeting, Governor Ricketts and Mr. Sonoura discussed the importance of trade to both countries and the upcoming Midwest U.S.–Japan Association Conference. More details about the conference and registration can be found by clicking here. 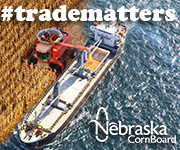 Japan is one of the top five importers of Nebraska products such as beef, pork, and soybeans. 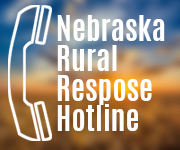 Additionally, Japan is Nebraska’s largest direct international investor with over $4.4 billion in foreign direct investment from Japanese companies since 2010, supporting thousands of jobs.